So far I’ve been happily using my Popcorn Hour A-110 media player for the daily media playing needs. Movies, usually play just fine with slight artifacts but mostly good quality except those seldom times when the Media Tank has a hard time understanding what on Earth I’m feeding it . I guess one of those times was a few weeks back when I was really anxious about watching a good movie when the PCH decided that it won’t play it. Period. It was one frustration too many for me. I decided to look into alternatives and mainly HTPCs. I’ve had some experience in building a small factor PC before, so the terrain was familiar enough to start doing some research. I finally settled on a Chenbro ES34169 case mated with Zotac’s H55ITX-A-E motherboard which in turn carried Intel’s new Core i3-530 2.9 Ghz processor. I am not going to review the parts as there are extensive reviews on the web, good reviews I might say, but instead focus a bit on the CPU cooling in conjunction with the case. 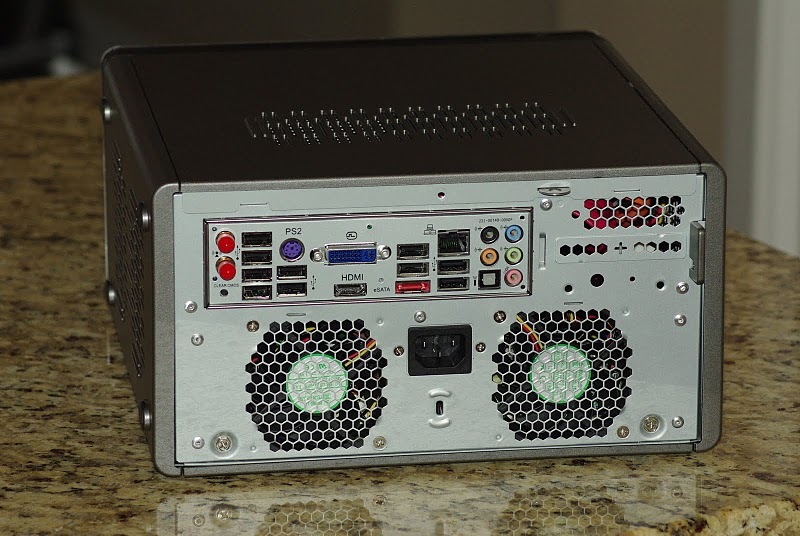 The Chenbro case appealed to my sense of beauty as it is very small, stylish, compact enough to fit in a tight media cabinet and also generous enough to fit 4 regular (3.5) hard drives plus a small 2.5 drive. That really says a lot about interior space in a case just 260 x 140 x 260 (mm). I personally like simple and efficient design out of which the Chenbro has both. There was a problem however. One that bugged me even before placing the order for the case and all other parts: CPU cooler clearance. I knew that the new 32nm Core i3 chips run much cooler than their 45nm counterparts so this was already some good news. After a few hours of asking around and crunching numbers from various websites, the conclusion was that the stock CPU cooler would not fit in this case. Fast forward to building time, surely enough, I was right. The heatsink fan was standing approximately 2 mm taller than the case. I have to say that even if it was lower than the case I still wouldn’t have used it as the airflow above the fan was totally inadequate. At only 36mm in height with this cooler I still had little clearance for air flow above the fan, but decided to go ahead with the build. 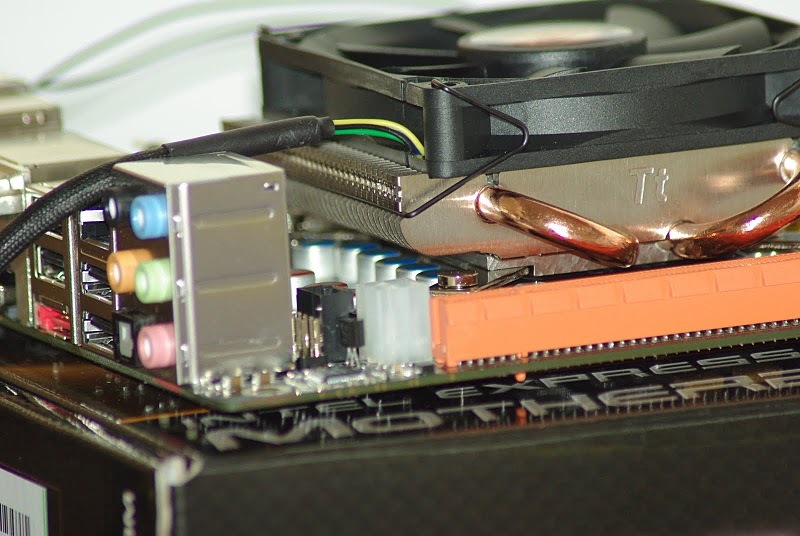 I need to mention that even if the case side panel has an air vent, exactly above the CPU heatsink, it’s not very efficient since the guys at Chenbro obviously did not give too much thought to this aspect or maybe they just considered design being more important than efficiency. The main problem is that the holes on the outside, being very narrow, do not line up with the square shaped holes in the inner aluminum case resulting in the airflow being mostly obstructed by this design feature. 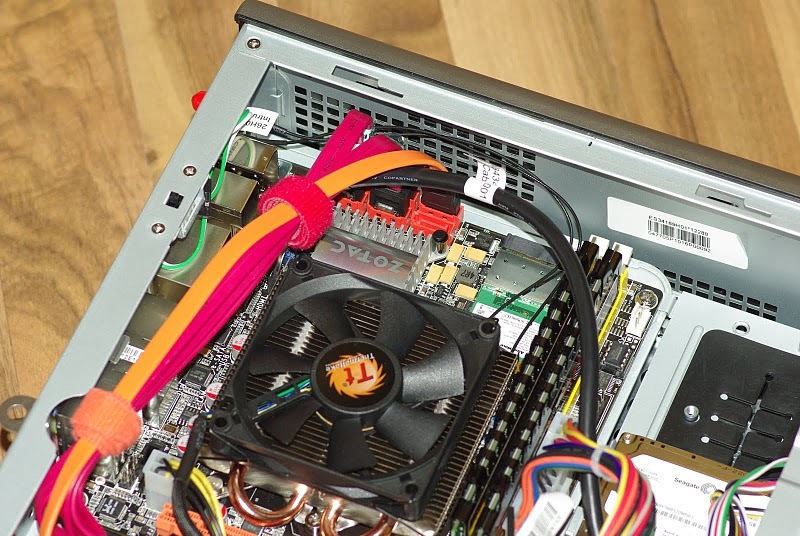 Note that the two fans on the back of the case only send air throughout the lower deck of the case where the PSU and the 4 hot-swap drive bays are located. For the upper deck there is no fan by default, but the case has the option of installing a 60mm case fan on the front panel. In the image bellow, in the lower right part there is a square air intake. Behind this intake there are mounts for the 60mm fan. Based on these temperature readings, my conclusion is that the Thermaltake HSF is doing it’s job pretty well for a 36mm low profile HSF, but on the downside it has to cope with an inadequate supply of fresh cool air to function at it’s peak. Personally I think the temperatures are OK for the non-intensive processing chores of an HTPC. If you have any questions related to this project, feel free to leave me a comment and I’ll try to assist in any way I can. Following, some more pictures [Use FULL SCREEN (FS) for better quality]. Live in Vancouver with kids? Try www.LittleTots.ca. Best source for Vancouver Kids Activities and Attractions! I was hoping you could answer some questions for me. Do you have any numbers on how much power the machine is using on idle and at load? I’m not sure if the 120W PSU is enough with an i3 in there and 4 HDDs. Also, did you have to buy a case fan separately (if so, link please) or did it come with the Chenbro? Finally, what OS did you settle with (any special raid config)? How’s the read/write performance? In my current config I have 3 hard drives with no optical drive. The PSU seems to be handling it quite well. The two HDD cage fans that you can see on the back of the case came with the package. Unfortunately there was no case fan for the upper deck where the motherboard is located. I had to pick up a 60 mm fan from a friend and add it to the case. As for the OS I am using Windows 7 x64 with no RAID config. I keep my backups on separate drives that most of the times are not powered. 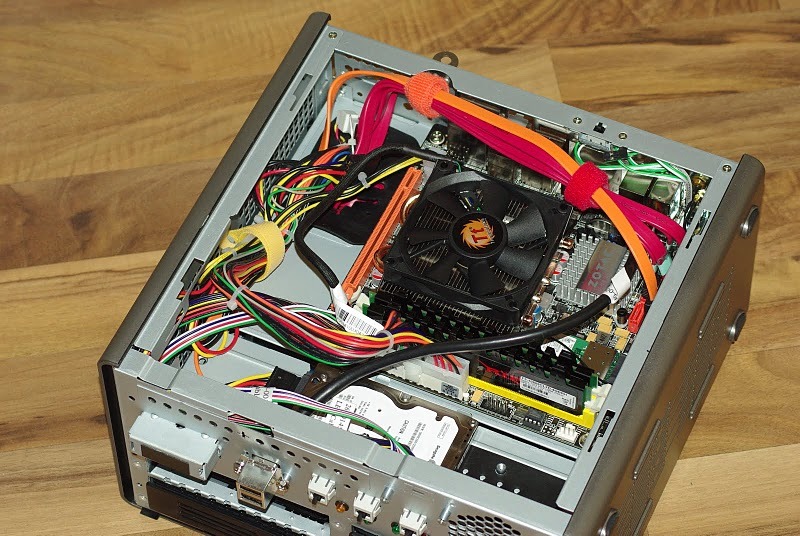 Has this case an internal psu or external? I mean, do you need a laptop adapter? 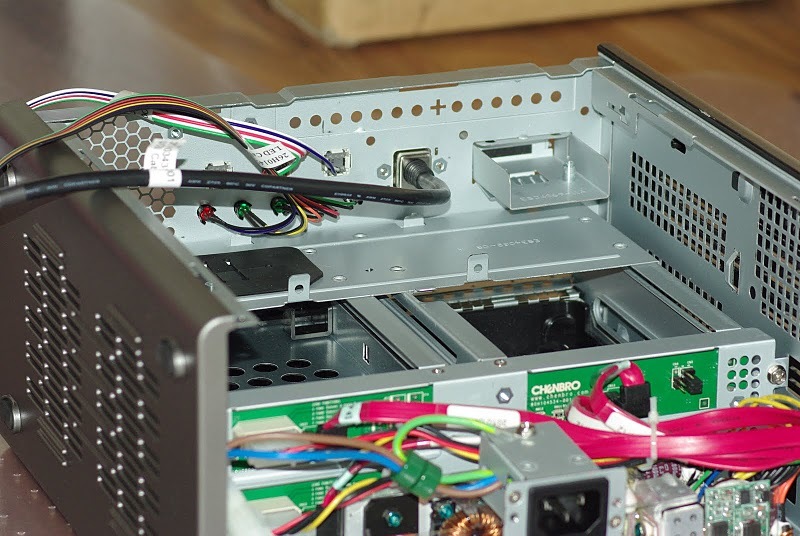 ES34169 has an internal PSU behind the hot swap drive bays. The ES34069 does not have that but instead it has an external brick PSU that comes in 120W and 180W flavors. I am not sure how they used the free space in the ES34069 as the overall case dimensions look the same. Hi Stefan, I’m really curious about this Zotac board and its support with OpenSolaris (I’m planning on using ZFS). Could you do me a huge favor and check if all the parts are supported? You’ll have to boot into an opensolaris livecd (http://www.genunix.org/dist/indiana/osol-dev-134-x86.iso). The livecd should boot you into gnome, and then you’ll have to go into Applications > System Tools > Device Driver Utility and it’ll show you if anything is missing. I’ll try to find some time this week for that. I’ll let you know. I did some tests, but they were not conclusive. It always hanged during boot up. I don’t think it was the motherboard but something related to the AHCI configuration. Unfortunately I don’t have an optical drive in that pc so it’s quite difficult for me to try fiddling with Open Solaris again. 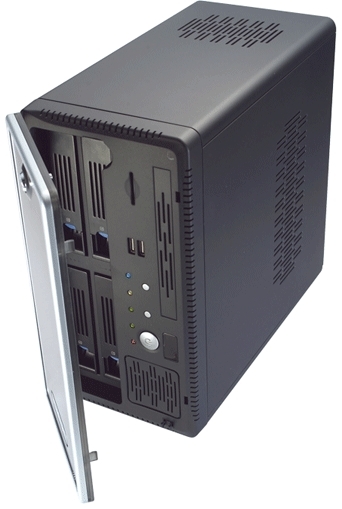 I am planning to make HTPC/torrent server with this case and some atom+ion m/b. My main concern is the noise and HDD temp. Could you please share your experience with it? I will measure the sound level next to the case, tonight. I will do it with the iPhone, so it might not be extremely accurate. 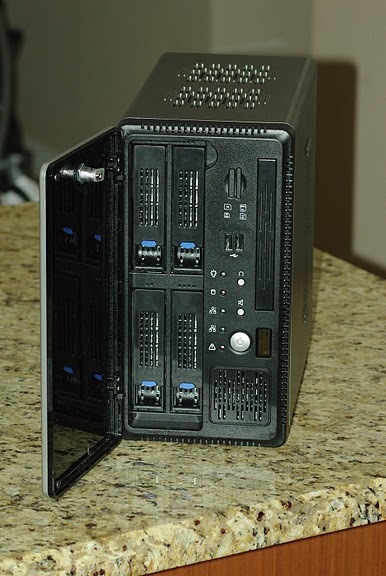 With regards to temperatures, I don’t have a temp sensor next to the drives, but you should bear in mind that the HDD compartment is completely separate from the MB+CPU compartment and it has it’s own two fans on the back of the case. These two fans blow air directly onto the PSU and then on the sides in the HDD compartment. Temperatures can be easy monitored by some utility that shows HDDs S.M.A.R.T. data. I prefer SpeedFan, but there are some more. Noise level in a completely silent room otherwise, is around 40dB. Measured a few inches away from the case with “Decibels” app on the iPhone. Temperatures for the drive bay are quite low as, usually, there’s only one drive ON, the others being in stand by. SMART tab in speed fan does not give any info, in fact it doesn’t even show hard drives. Didn’t have time to look into it. 30cm cables should reach, but I wasn’t sure if they were too long. The sata cables are the usual length. It’s more than enough. Unfortunately I can’t measure them without dismantling the pc, but suffice it it say that I was left with some unwanted slack after connecting the drives. Thanks for this detailed build guide. 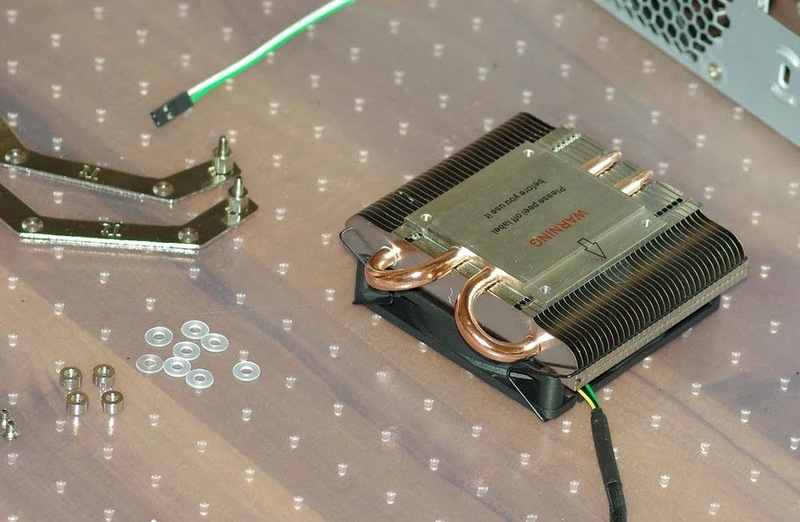 Do you know if the Thermaltake cpu cooler you are using blows air down onto the heatsink and cpu or if it draws air away from it upwards. Thanks. I am pretty sure it blows air onto the cooler. It doesn’t make too much sense to draw the air up since the air close to the pcb is much warmer than the air on top of the CPU cooler. I think this us how most if the CPU cooler fans work. On many cases there are air vents exactly on top of the cooler do the cool air can get in. But again, I might be wrong. The PSU has active or passive cooling? I really intrested in absolutely silent system. And one more thing. Is there really no front panel cardreader in the default shipping? The psu itself is not self contained. It’s an open component inside the case. However the two fans on the back of the case blow air directly onto it and past it towards the drive cages. The fans are pretty silent. That’s correct about the card reader. It’s not included with the case. thak you for this great article. Could you tell me something about the noiselevel of the 70mm fans at the back? Would it technically be possible to replace them? What are the specifications (70*70*15, or 70*70*25)? As stated in a previous comment, the noise level is around 40db measured with an iPhone right next to the case. They are definitely replaceable, however I can’t give you exact measurements right now. As soon as I open the case I will get back to you. I just built a home storage server using this case. The rear fans that came with mine are 70 x 70 x 25. Hope that helps. which says, they are 70*15. Second question. The sata cable are a little bit too long for my taste. Would it technically possible to replace them with shorter ones? Not only technically but it’s also physically possible to replace them. Absolutely. I’ve the chenbro case paired with an atom motherboard. I’m going to replace it with Zotac H67-ITX-C-E and an i3-2100t. For your information the stock HSF is about 30mm height. Markus, I’ve connected the rear 2 fans to 5V line and there’s no noise from them, obviously they’re running at low speed. I am currently building a system on h67. There shouldn’t be any problem on clearance. Also, I have all but praise for Scythe. They do an awesome job in coolers, especially with this type of fan sandwiched between the plate and the cooler. I didn’t. You need the corresponding connectors on the motherboard for that. thanks for this post. I am currently running a Supermicro X7SPA-HF (with Atom D510) inside a Chenbro ES34069 (with external 180W PSU) and am thinking about upgrading the board and CPU. My question is: would you be comfortable to batch-encode videos on this machine? I am a bit unsure whether the cooling is really sufficient. Maybe the Chenbro PSU was defective. 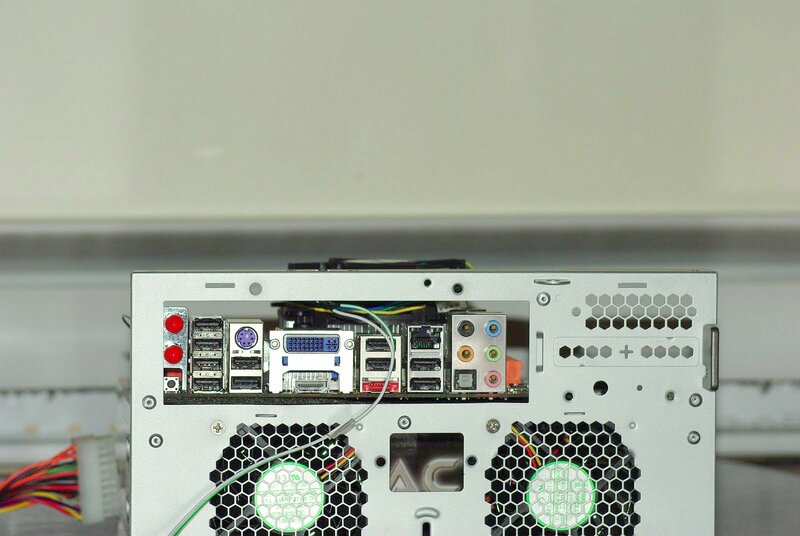 Some PSUs are known to fry partially and only able to power up at low loads. I can say that in my setup, the Chenbro PSU works just fine with the Zotac MB and the i3. In my configuration I’ve 4 3.5″ SATA disks (RAID5), 1 2.5″ SATA (boot) and one ODD, there’s no power issue booting this configuration with the 120W Power suply. Try to delay the HDD spinup in BIOS configuration, there’s an option to do this.